This website is to tell about my SOE Agents movie which is still in pre-production at the moment. These pages will feature Scripts, Props, Wardrobe, Special effects and a look behind the scenes. Set in World War Two, this is the story of Nicole, a female secret agent parachuted behind enemy lines of German occupied France. Following Winston Churchill's admonition to "Set Europe Ablaze," she makes contact with the resistance and instructs them in the use of weapons and explosives. Their mission: To make things as difficult as possible for the Germans. To frustrate the Germans plans to invade Britain and to lay the foundations for the allied invasion known as D Day. They face danger and fear of capture and torture by the Gestapo. The Major. He interviews Nicole and offers her the job of SOE agent. Here is the F.A.N.Y. (First Aid Nursing Yeomanry) uniform that our agent will wear while in training. Her cover while training will be that she has joined the First Aid Nursing Yeomenary. Another prop for our movie. Liquid Stockings. In those days stockings were made from silk. Because of the war all the silk was needed to make parachutes. So no more silk stockings. Women would rub this liquid on their legs to make it look like they were wearing stockings. They added a finishing touch by drawing the seam on the back of their legs with a pencil. After training she is issued with the necessary equipment. Here is the FS fighting Knife. This is used not so much for fighting as for sentry take-outs. This is a code sheet printed on silk. It can be hidden in the lining of a jacket or in the lapel. Being silk it won't rustle if she is searched. She uses a new code every time she sends a message. After sending the message she cuts off the strip with that code on it and burns it for security. This is a map printed on silk. It can be hidden in a jacket lining or in a lapel. If she is searched it will not rustle. She can use this along with the compass if she is lost or escaping from the Gestapo. Before departure agents are issued with a revolver for their own personal protection. Agents were issued with Benzedrine tablets to keep them going in times when they were feeling too weak and tired to complete a mission. Agents were also issued with glass cyanide capsules (suicide pills) also known as lethal pills or "L Pills". They were to take one if captured and felt they could no longer hold out against the torture. Our agent can not have anything on her that is not French. She will have to exchange her British cigarettes for French ones. Before she leaves she must also remove her British Military watch. The Major's watch is the black one and the agents one is the white faced one. She will also be issued with a Minox B camera hidden in a cigarette pack.. This is the RAF type X parachute that our agent will use when she is dropped into occupied France. Unlike American parachutes of the time, this model did not have a reserve parachute. This was because the British jumped from a much lower altitude than the Americans and this did not allow adequate time to use a reserve. The British Type X was also more reliable. This is the parachute, jump suit and other gear that our agent will wear when she is dropped into occupied France. Our agent will also have this with her when she jumps. 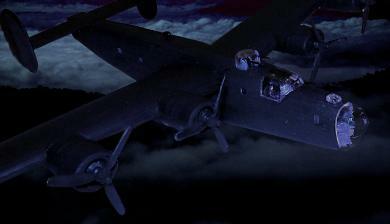 Here is the bomber that will drop her behind enemy lines. This miniature will be animated and keyed over a live background.